We are proud to announce a very special addition to our future broodmare band. Flower is the daughter of the Holland NUMBER ONE Jumper broodmare with offspring in sport , the great HARMONIE. Flower is a copy of her sire Nabab de rêve. She is a confident and powerful lady with a gentle attitude. Harmonie (Calvados/ Voltaire) has been leading the breeding value in Holland for broodmares with offspring in sport for the past nine years with a fabulous index of 185 in 2010. This mare line is superior and is making the top list in the breeding value all categories. Our own mare Prelude is a full sister of Harmonie and she was ranked 13th on this same prestigious list which makes her the highest breeding index mare outside Holland. Their dam Electra was on the 13th position (BV162). For the breeding value of younger mares with no offspring in sport, four of them in the top 20 are closely related to Harmonie and Prelude's dam, Electra. Harmonie has received all the KWPN predicates a mare can have; Elite, Sport, Preferent and Prestatie. This is possibly the best performance jumper mare line currently available here in America being second in the world for having 4 generations in a row with mares jumping succesfully at 1.35 m or more. Harmonie has three and Prelude one offspring in this listing. Harmonie was successful as an International jumper and is considered as one of the best offspring of the Keur stallion Calvados. She has produced performance offspring on a non-stop basis; amongst siblings of Flower there is the recently KWPN approved stallion Dutch Design, a Star mare, an Approved SBS ZZ level (4'5'') sport stallion, an Elite Sport Preferent International jumper, an Elite Sport ZZ level mare, and a 7 years old Z mare (4'3'') with a EPTM score of 87 and who's 2007 offspring stallion Comme Il faut has been approved in the Zangersheide studbook. In 2011 Dutch Design by Dollard de la Pierre, was Reserve Champion with one points behind the Champion of the performance test with a score of 82.5 points. He had a nine for his scope, 8.5 for canter, 7.5 reflexes, 8 technique, 8 attitude and rideability and 8.5 for his overall jumping talent. Dutch Design is considered an asset by the jury with his very good canter and superior power and gave him a projected breeding index of 160. And to continue her legacy one of her daughter Apropos n'Liefhebber has her first son Extra Power just being accepted to the second round for the 2012 stallion show. This daughter had a EPTM of 82.5 with a 9 for reflexes and 8.5 for scope. Harmonie is obviously an exceptional mare out of an outstanding mare line. Her close relatives are loaded with talents, predicates, approved stallions and performance results so the best genetics is simply spread in this family which give the best chances to produce high quality horses on a most reliable basis. Harmonie's dam, Electra is a Preferent Sport Prestatie mare from the Keur preferent stallion Voltaire. She competed at National level and retired to produce outstanding sport horses and broodmares. Her dam the Ster Sport Uranda by Le Mexico was an international jumper. Electra is ranked 13th in the breeding value for mares with offspring in sport (BV 162). Beside her great daughter Hamrmonie, Electra produced two Approved AES stallions, one that competed successfully at Z level , one Keur Sport National jumper mare, one Elite Preferent prestatie Sport International jumper mare and two Elite mares. Electra' sire, Voltaire needs no introduction. He is the result of crossing two outstanding bloodlines: Furioso II and Gotthard. Furioso II produced 200 state premium mares and at least 70 approved stallions of which several are standing at stud in other continents. Furioso II had a tremendous influence on the breeding industry worldwide. His full brother is the French stallion Mexico. His son Le Mexico is very familiar in Dutch breeding and frequently appears in the pedigrees of successful show jumpers such in Electra's dam line. Furioso II also sired the Olympic gold medal winners Lutteur B and Pomone B.
Voltaire's dam, Gogo Moeve, was the dam to such horses as Fandango R, PS Falkan and Petite Fleur. She was sired by the great Gotthard, a stallion who has made his mark in the Hanoverian breed. Gotthard is seen in the pedigree of such horses as Goldika, Goya, Queensway, Genius, Grundstein and Grannus. Gogo Moeve's dam-sire was the Thoroughbred stallion More Magic, who also sired the 1980 Moscow Olympics dressage gold medalist, Mon Cherie, ridden by Elisabeth Theurer. As an 8 year old Voltaire jumped 1.50 m. courses with a great deal of success. He showed his strength in international jumping in 1988 in Calgary, Stockholm, Lanaken, Helsinki, Wiesbaden and Wembley and in 1989 he brought his show jumping career to a successful ending by winning the Grand Prix of Berlin with Jos Lansink and 2nd in the Grand Prix of Leeuwarden. Voltaire was the sire with the most offspring at the Olympic Games of Atlanta in 1996. Voltaire has over 50 approved sons. Many of his offspring jump at Grand Prix level, i.e. Kannan, Finesse, Altaire, Kahlua, Play it Again, Helios, Electro, Especial etc. etc. Foltaire, ridden by Günther Seidel is a famous offspring of Voltaire in the international dressage ring. Voltaire has been awarded ?Huntersire of the Year 2001, 2002 and 2003? in the USA. It is exceptionnaly rare to find a mare with such record, not only from her own sport career but also from her foal?s production. 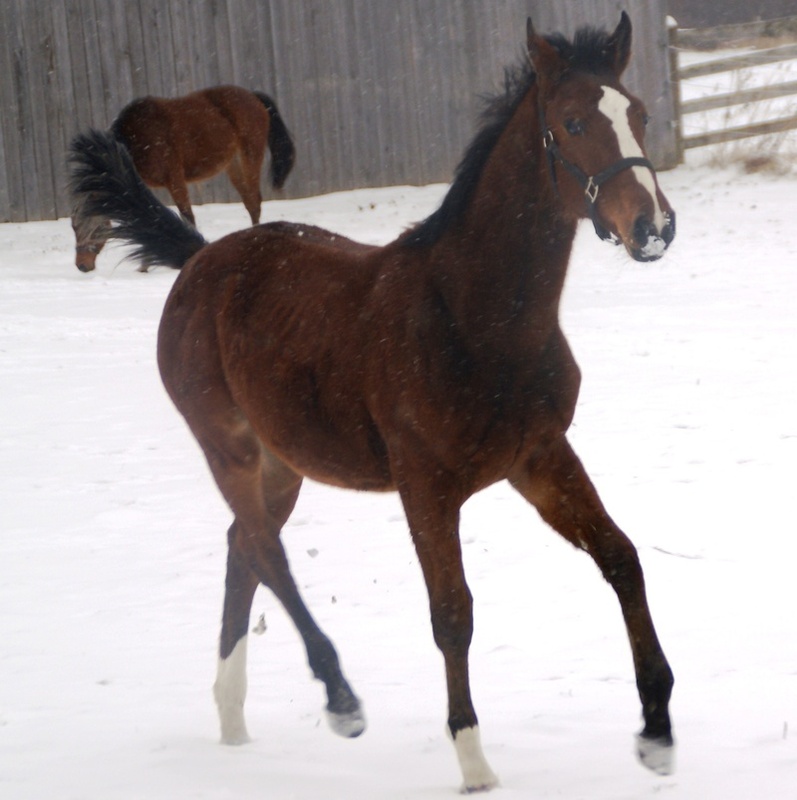 As we know, the mare is the most important part of the equation and we felt fortunate to own one of her daughter. Nabab de rêve is one of the best son of the famous International jumper Quidam de Revel. In the 2009 WBFSH jumping stallion rankings Nabab de Reve is in 5th place. Nabab de rêve is out of a mare by Artichaut, a good sire of jumpers at national and international level, including the stallion, Quartz du Vallon, and Orchestre, ridden by McLain Ward to many Grand Prix wins and placing. He was also sire of Muguet de Manoir, a leading sire in France over two seasons. In 1993, Nabab de Reve was second in the Belgian 4 year old championships, and two years later, a finalist in the 6 year old class. In 2001 he was a Nations Cup winner at Aachen, 2nd in La Baule and 4th in Rome. Under Philippe Lejeune, Nabab competed at the European Championships in Arnhem and in the bronze medal winning Belgian team at the WEG at Jerez. His son Bacardi van?t Lambroeck was licensed by the BWP in 2004. Winsome v d Plataan won the 6 year old World title with David Jobertie in 2005. His heir has already been nominated ? Vigo d?Arsouille out of a mare by Fleuri du Manoir. This young stallion has been licensed by both the BWP and the sBs, and ridden ? like his sire ? by Philippe Lejuene ? has represented his nation. The pair competed for Belgium at the 2007 European Championships, after placing second in the CSIO 5* at Gijon. Vigo d?Arsouille was declared Belgian Horse of the Year 2008, following a win in the Belgian Championships and a 5th at Aachen. He was recently approved KWPN . Two other progeny of Nabab de Reve were nominated for the title: Valentina van ?t Heike and Walnut de Muze. The pedigree of FLOWER is loaded with National and International jumpers . KWPN 86.6066 pref prestatie sport (spr) Stb.